Ismail Enver Pasha (Ottoman Turkish: اسماعیل انور پاشا‎; Turkish: Ismail Enver Pasa; 22 November 1881 – 4 August 1922) was an Ottoman military officer and a leader of the 1908 Young Turk Revolution. He became the main leader of the Ottoman Empire in both the Balkan Wars (1912–13) and in World War I (1914–18). In the course of his career he was known by increasingly elevated titles as he rose through military ranks, including Enver Efendi (انور افندي‎), Enver Bey (انور بك‎), and finally Enver Pasha, "pasha" being the honorary title Ottoman military officers gained on promotion to the rank of Mirliva. 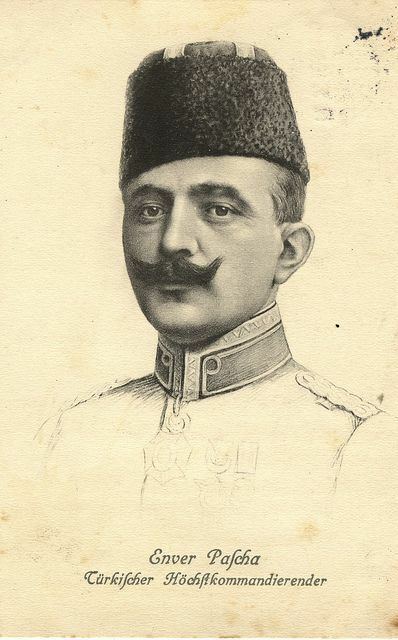 After the Ottoman coup d’etat of January 1913, Enver Pasha became (4 January 1914) the Minister of War of the Ottoman Empire, forming one-third of the triumvirate known as the "Three Pashas" (along with Talaat Pasha and Djemal Pasha) who held de facto rule over the Empire from 1913 until the end of World War I in 1918. 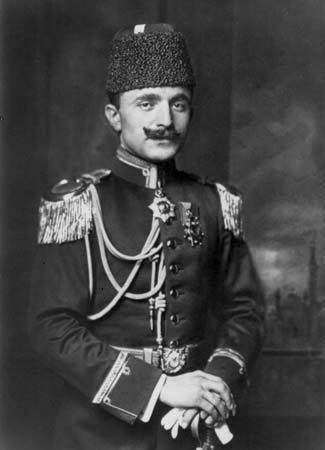 As war minister and de facto Commander-in-Chief (despite his role as the de jure Deputy Commander-in-Chief, as the Sultan formally held the title), Enver Pasha was the most powerful figure of the government of the Ottoman Empire. He decided to involve the Empire in World War I on the side of Germany. Along with Talaat and Djemal, he was one of the principal perpetrators of the Armenian Genocide. Prior to World War I, he was hailed at home as "the hero of the revolution", and Europeans often spoke of Ottoman Turkey as "Enverland". Enver was born in Istanbul on 22 November 1881. 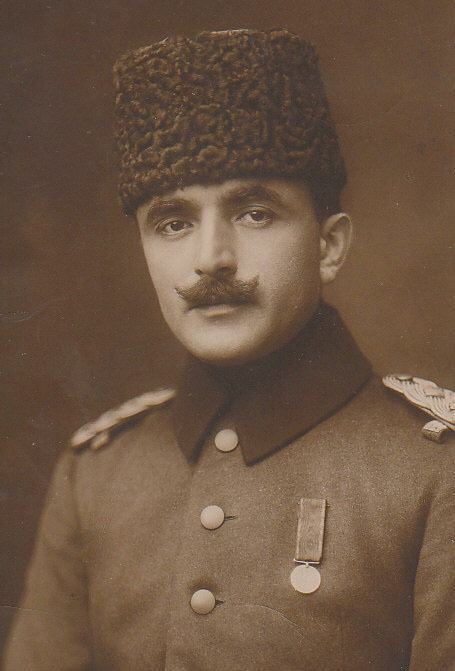 Enver's father, Ahmed (c. 1860–1947), was either a bridge-keeper in Monastir or a small town public prosecutor in the Balkans and his mother Ayse an Albanian peasant. His uncle was Halil Pasha (later Kut). Enver had two younger brothers, Nuri and Mehmed Kamil, and two younger sisters, Hasene and Mediha. He studied for different degrees in military schools in the empire and ultimately graduated from the Harp Akademisi with distinction in 1903. He became a Major in 1906. He was sent to the Third Army, which was stationed in Salonica. During his service in the city, he became a member of the Committee of Union and Progress (CUP). In 1908, the Young Turk Revolution broke out in Salonica, and the young Enver quickly became one of its military leaders. The successful revolt brought the CUP to power, ushering in the Second Constitutional Era of the Ottoman Empire. During the course of the next year, a reactionary conspiracy to organize a countercoup culminated in the "31 March Incident", which was put down. Enver Bey took an active role in the suppression of the countercoup. Afterwards, he was sent to Berlin as a military attache, where he grew to admire the German military culture and strengthened the military ties between Germany and the Ottoman Empire, inviting German officers to reform the Ottoman Army. In 1911, Italy launched an invasion of the Ottoman vilayet of Tripolitania (Trablus-i Garb, modern Libya), starting the Italo-Turkish War. Enver decided to join the defense of the province and left Berlin for Libya. There, he assumed the overall command after successfully mobilizing 20,000 troops. Because of the outbreak of the Balkan Wars, however, Enver and other Ottoman generals in Libya were called back to Istanbul. This allowed Italy to take control of Libya. In 1912, thanks to his active role in the war, he was made Lieutenant Colonel. However, the loss of Libya cost the CUP in popularity, and it fell from government after rigging the 1912 elections (known as the Sopali Secimler, "Election of Clubs"), to be replaced by the Liberal Union party (which was helped by its military arm, the Savior Officers, that denounced the CUP's actions during the 1912 elections). The defeated CUP assumed an ideology favoring more centralization under Enver. In October 1912, the First Balkan War broke out, where the Ottoman armies suffered severe defeats at the hands of the Balkan League. These military reversals weakened the government, and gave Enver his chance to grab for power from the Liberal Union. In a coup in January 1913, he returned power to the CUP from the Liberal Union and introduced a triumvirate that came to be called the "Three Pashas" (Enver Pasha, Talaat Pasha, and Djemal Pasha). He took the office of Minister of War. In 1914, he was again Minister of War in the cabinet of Said Halim Pasha, and married HIH Princess Emine Naciye Sultan (1898–1957), the daughter of Prince Suleyman, thus entering the royal family as a damat ("bridesgroom" to the ruling House of Osman). His power grew steadily while Europe marched towards total war. He then left the peace negotiations then under way in London. The renewed hostilities only worsened the Empire's situation, however, as the two major remaining strongholds of Adrianople (Edirne) and Yannina fell to the Bulgarians and the Greeks, respectively, forcing the Ottomans to concede defeat at the Treaty of London. In June 1913, however, the Second Balkan War broke out between the Balkan Allies. Enver Bey took advantage of the situation and led an army into Eastern Thrace, recovering Adrianople from the Bulgarians, who had concentrated their forces against the Serbs and Greeks. After this success, Enver Bey became a Pasha, and recognised by some Turks as the "conqueror of Edirne". Enver Pasha was an architect of the Ottoman-German Alliance, and expected a quick victory in the war that would benefit the Ottoman Empire. Without informing the other members of the Cabinet, he allowed the two German warships SMS Goeben and SMS Breslau, under the command of German admiral Wilhelm Souchon, to enter the Dardanelles to escape British pursuit; the subsequent "donation" of the ships to the neutral Ottomans worked powerfully in Germany's favor, despite French and Russian diplomacy to keep the Ottoman Empire out of the war. Finally on 29 October, the point of no return was reached when Admiral Souchon, now Commander-in-Chief of the Ottoman navy, took Goeben, Breslau, and a squadron of Ottoman warships into the Black Sea and raided the Russian ports of Odessa, Sevastopol, and Theodosia. Russia declared war on Ottoman Empire on 2 November, and Britain followed suit on 5 November. 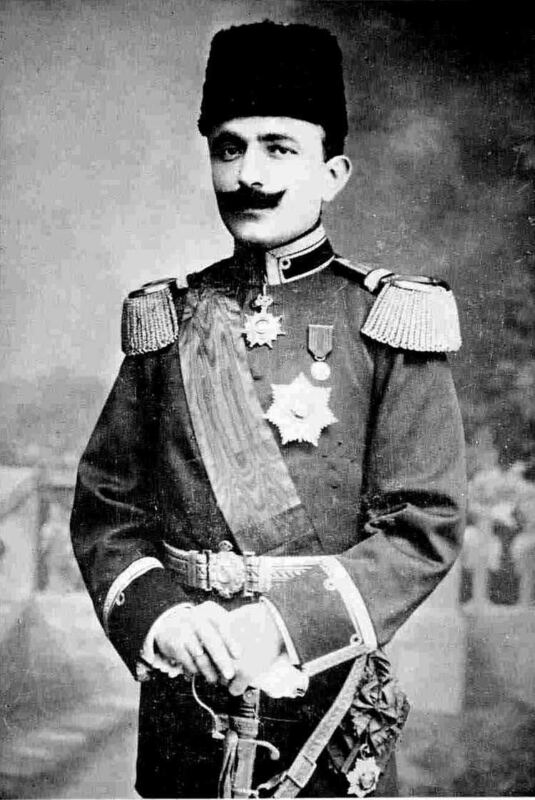 Most of the Turkish cabinet members and CUP leaders were against such a rushed entry to the war, but Enver Pasha held that it was the right course of action. As soon as the war started, 31 October 1914, Enver ordered that all men of military age report to army recruiting offices. The offices were unable to handle the vast flood of men, and long delays occurred. This had the effect of ruining the crop harvest for that year. After taking office in 1913, Enver proved ineffective as War Minister, and frequently over the next four years, the Germans had to support the Ottoman government with generals such as Otto Liman von Sanders, Erich von Falkenhayn, Colmar Freiherr von der Goltz, and Friedrich Freiherr Kress von Kressenstein. The Germans also gave the Ottoman government military supplies, soldiers, and fuel. Enver Pasha's message to the army and the people was "war until final victory". During the war, living conditions deteriorated rapidly, and discontent grew. Enver would remain War Minister until he fled the country in 1918. Enver Pasha assumed command of the Ottoman forces arrayed against the Russians in the Caucasus theatre. He wanted to encircle the Russians, force them out of Ottoman territory, and take back Kars and Batumi, which had been ceded after the Russo-Turkish War of 1877–78. Enver thought of himself as a great military leader, while the German military adviser, Liman von Sanders, thought of him as incompetent. 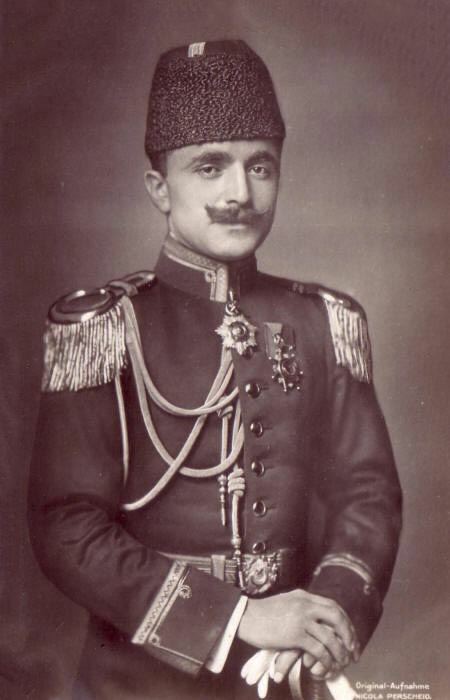 Enver ordered a complex attack on the Russians, placed himself in personal control of the Third Army, and was utterly defeated at the Battle of Sarikamish in December 1914 – January 1915. His strategy seemed feasible on paper, but he had ignored external conditions, such as the terrain and the weather. Enver's army (90,000 men) was defeated by the Russian force (100,000 men), and in the subsequent retreat, tens of thousands of Turkish soldiers died. This was the single worst Ottoman defeat of World War I. On his return to Constantinople, Enver Pasha blamed his failure on his Armenian soldiers, although in January 1915, an Armenian named Hovannes had saved his life during a battle by carrying Enver through battle lines on his back. Nonetheless, Ismail Pasha later initiated the deportations and sporadic massacres of Western Armenians, culminating in the Armenian Genocide. After his defeat at Sarikamish, Enver returned to Constantinople and took command of the Turkish forces around the capital. He was confident that the capital was safe from any Allied attacks. The British and French were planning on forcing the approaches to Constantinople in the hope of knocking the Ottomans out of the war. A large Allied fleet assembled and staged an attack on the Dardanelles on 18 March 1915. The attack (the forerunner to the failed Gallipoli campaign) left the Turks—and Enver—demoralized. As a result, Enver turned over command to Liman von Sanders, who led the successful defence of Gallipoli, along with Mustafa Kemal. Later, after many towns on the peninsula had been destroyed and women and children killed by the Allied bombardment, Enver proposed setting up a concentration camp for the remaining French and British citizens in the empire. Henry Morgenthau, the American ambassador to the Ottoman Empire, convinced Enver not to go through with this plan. Enver’s plan was for Falkenhayn’s Yildirim Army Group to retake Baghdad, recently taken by Maude. This was nearly impossible for logistical reasons. Turkish troops were deserting freely, and when Enver visited Beirut in June 1917 soldiers were forbidden to be stationed along his route for fear that he would be assassinated, and lack of rolling stock meant that troops were often detrained at Damascus and marched south. During 1917, due to the Russian Revolution and subsequent Civil War, the Russian army in the Caucasus had ceased to exist. At the same time, the Committee of Union and Progress managed to win the friendship of the Bolsheviks with the signing of the Ottoman-Russian friendship treaty (1 January 1918). Enver looked for victory when Russia withdrew from the Caucasus region. When Enver discussed his plans for taking over southern Russia, the Germans told him to keep out. Undeterred, Enver ordered the creation of a new military force called the Army of Islam which would have no German officers. Enver's Army of Islam avoided Georgia and marched through Azerbaijan. The Third Army was also moving forward to pre-war borders. The Third Army moved towards the Democratic Republic of Armenia, which formed the frontline in the Caucasus. General Tovmas Nazarbekian was the commander on the Caucasus front, and Andranik Ozanian took the command of Armenia within the Ottoman Empire. Vehib Pasha forced the Armenians to retreat and then captured Trabzon, where the Russians had left huge quantities of supplies. Then the army turned towards Georgia. The Army of Islam, under the control of Nuri Pasha, moved forward and attacked Australian, New Zealand, British, and Canadian troops led by General Lionel Charles Dunsterville at Baku. General Dunsterville ordered the evacuation of the city on 14 September, after six weeks of occupation, and withdrew to Iran; most of the Armenian population escaped with British forces. The Ottomans and their Azerbaijani allies, after the Battle of Baku, entered the city on 15 September. However, after the Armistice of Mudros between Great Britain and the Ottoman Empire on 30 October, Ottoman troops were replaced by the Triple Entente. These conquests in the Caucasus counted for very little in the war as a whole. Faced with defeat, the Sultan dismissed Enver from his post as War Minister on 4 October 1918, while the rest of Talaat Pasha's government resigned on 14 October 1918. On 30 October 1918, the Ottoman Empire capitulated by signing the Armistice of Mudros. Two days later, the "Three Pashas" all fled into exile. On 1 January 1919, the new government expelled Enver Pasha from the army. He was tried in absentia in the Turkish Courts-Martial of 1919–20 for crimes of "plunging the country into war without a legitimate reason, forced deportation of Armenians and leaving the country without permission" and condemned to death. Enver first went to Germany, where he communicated and worked with German Communist figures like Karl Radek. In April 1919, Enver left for Moscow in order to serve as a secret envoy for his friend General Hans von Seeckt who wished for a German-Soviet alliance. In August 1920, Enver sent Seeckt a letter in which he offered on behalf of the Soviet Union the partition of Poland in return for German arms deliveries to Soviet Russia. Besides working for General von Seeckt, Enver envisioned cooperation between the new Soviet Russian government against the British, and went to Moscow. There he was well-received, and established contacts with representatives from Central Asia and other exiled CUP members as the director of the Soviet Government’s Asiatic Department. He also met with Bolshevik leaders, including Lenin. He tried to support the Turkish national movement and corresponded with Mustafa Kemal, giving him the guarantee that he did not intend to intervene in the movement in Anatolia. Enver Pasha went to Baku between 1 and 8 September 1920 to take part in the failed "Congress of Eastern Peoples", representing Libya, Tunisia, Algeria, and Morocco. He later returned to Berlin where he tried to establish a secret organization that would transfer Russian military assistance to Turkey, an attempt that eventually failed. Much has been written about the poor relations between Enver and Mustafa Kemal, two men who played pivotal roles in the Turkish history of the 20th century. Enver disliked Mustafa Kemal for his circumspect attitude toward the political agenda pursued by his Committee of Union and Progress, and regarded him as a serious rival. Mustafa Kemal (later known as Ataturk) considered Enver to be a dangerous figure who might lead the country to ruin; he criticized Enver and his colleagues for their policies and their involvement of the Ottoman Empire in World War I. In the years of upheaval that followed the Armistice of October 1918, when Mustafa Kemal led the Turkish resistance to occupying and invading forces, Enver sought to return from exile, but his attempts to do so and join the military effort were blocked by the Ankara government under Mustafa Kemal. On 30 July 1921, with the Turkish War of Independence in full swing, Enver decided to return to Anatolia. He went to Batum to be close to the new border. However, Mustafa Kemal did not want him among the Turkish revolutionaries. Mustafa Kemal had stopped all friendly ties with Enver Pasha and the CUP as early as 1912, and he explicitly rejected the pan-Turkic ideas and what Mustafa Kemal perceived as Enver Pasha’s utopian goals. Enver Pasha changed his plans and traveled to Moscow where he managed to win the trust of the Soviet authorities. In November 1921 he was sent by Lenin to Bukhara in the Turkestan Autonomous Soviet Socialist Republic to help suppress the Basmachi Revolt against the local pro-Moscow Bolshevik regime. Instead, however, he made secret contacts with some of the rebellion’s leaders and, along with a small number of followers, defected to the basmachi side. His aim was to unite the numerous basmachi groups under his own command and mount a co-ordinated offensive against the Bolsheviks in order to realize his pan-Turkic dreams. After a number of successful military operations he managed to establish himself as the rebels’ supreme commander, and turned their disorganized forces into a small but well-drilled army. His command structure was built along German lines and his staff included a number of experienced Turkish officers. However Enver’s personal weaknesses reasserted themselves. He was a vain, strutting man who loved uniforms, medals and titles. For use in stamping official documents, he ordered a golden seal that described him as ‘Commander-in-Chief of all the Armies of Islam, Son-in-Law of the Caliph and Representative of the Prophet.’ Soon he was calling himself Emir of Turkestan, a practice not conducive to good relations with the Emir whose cause he served. At some point in the first half of 1922, the Emir of Bukhara broke off relations with him, depriving him of troops and much-needed financial support. The Emir of Afghanistan also failed to march to his aid. On 4 August 1922, as he allowed his troops to celebrate the Kurban Bayrami (Eid al-Adha) holiday while retaining a guard of 30 men at his headquarters near the village of Ab-i-Derya near Dushanbe, the Red Army Bashkir cavalry brigade under the command of Yakov Melkumov (Hakob Melkumian) launched a surprise attack. According to some sources, Enver and some 25 of his men mounted their horses and charged the approaching troops, when Enver was killed by machine-gun fire. 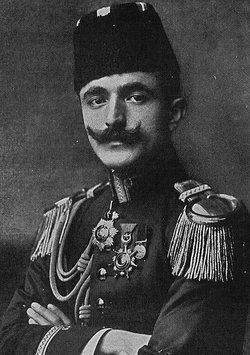 In his memoirs, Enver Pasha’s aide Yaver Suphi Bey stated that Enver Pasha died of a bullet wound right above his heart during a cavalry charge. Alternatively, according to Melkumov’s memoirs, Enver managed to escape on horseback and hid for four days in the village of Chaghan. His hideout was located after a Red Army officer infiltrated the village in disguise. Melkumov’s troops then stormed Chaghan, and in the ensuing combat Enver was killed by Melkumov himself. There are several accounts of how Enver died. According to the most persuasive of them, when the Russians attacked he gripped his pocket Koran and, as always, charged straight ahead. Later his decapitated body was found on the field of battle. His Koran was taken from his lifeless fingers and was filed in the archives of the Soviet secret police. Enver’s body was buried near Ab-i-Derya. In 1996, his remains were brought to Turkey and reburied at Abide-i Hurriyet (Monument of Liberty) cemetery in Sisli, Istanbul. Enver’s image remains controversial in Turkey, since there are those who blame him for the Ottoman entrance into World War I and the subsequent collapse of the Empire. After Enver’s death, three of his four siblings, Nuri (1889–1949), Mehmed Kamil (1900–62), and Hasene, adopted the surname "Killigil" after the 1934 Surname Law required all Turkish citizens to adopt a surname. Enver’s sister Hasene Hanim married Nazim Bey. 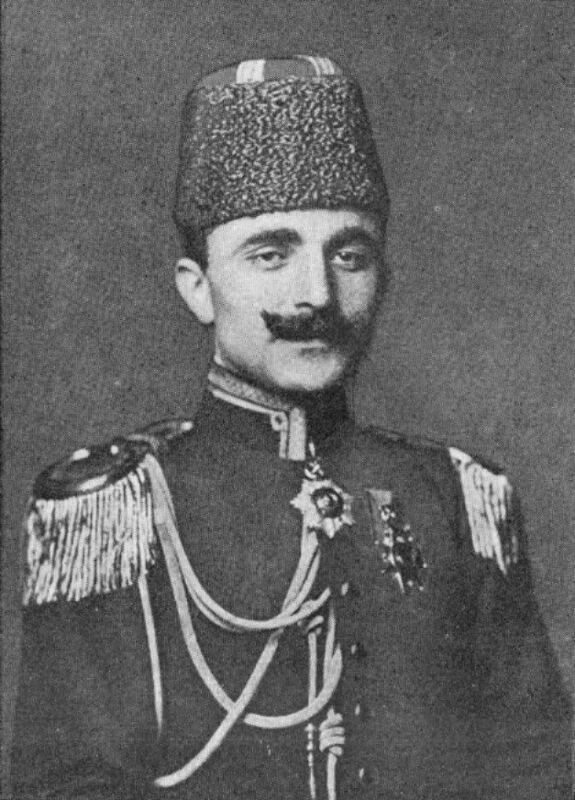 Nazim Bey, an aid-de-camp of Abdul Hamid II, survived an assassination attempt during the 1908 Young Turk Revolution of which his brother-in-law Enver was a leader. With Nazim, Hasene gave birth to Faruk Kenc (1910–2000), who would become a famous Turkish film director and producer. Enver’s other sister, Mediha Hanim (later Mediha Orbay; 1895–1983), married Kazim Orbay, a prominent Turkish general and politician. On 16 October 1945, their son Hasmet Orbay, Enver's nephew, shot and killed a physician named Neset Naci Arzan, an event known as the "Ankara murder". At the urging of the Governor of Ankara, Nevzat Tandogan, Hasmet Orbay's friend Resit Mercan initially took the blame. After a second trial revealed Hasmet Orbay as the perpetrator, however, he was convicted. The murder became a political scandal in Turkey after the suicide of Tandogan, the suspicious death of the case’s public prosecutor Fahrettin Karaoglan, and the resignation of Kazim Orbay from his position as Chief of the General Staff of Turkey after his son’s conviction.